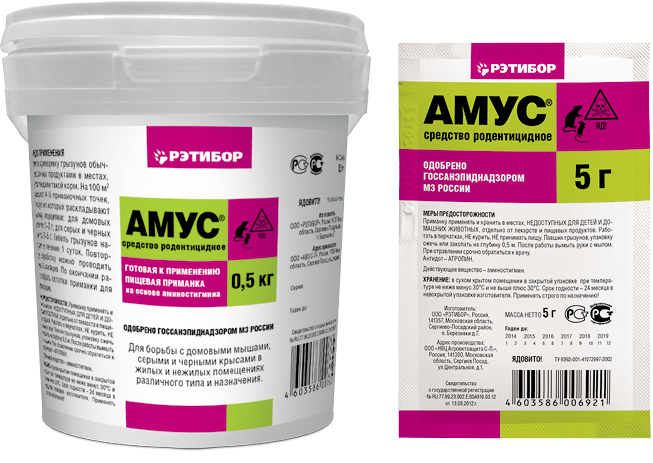 The rodenticide is manufactured in 5 g polyethylene bags and 0.5 kg polymeric buckets. 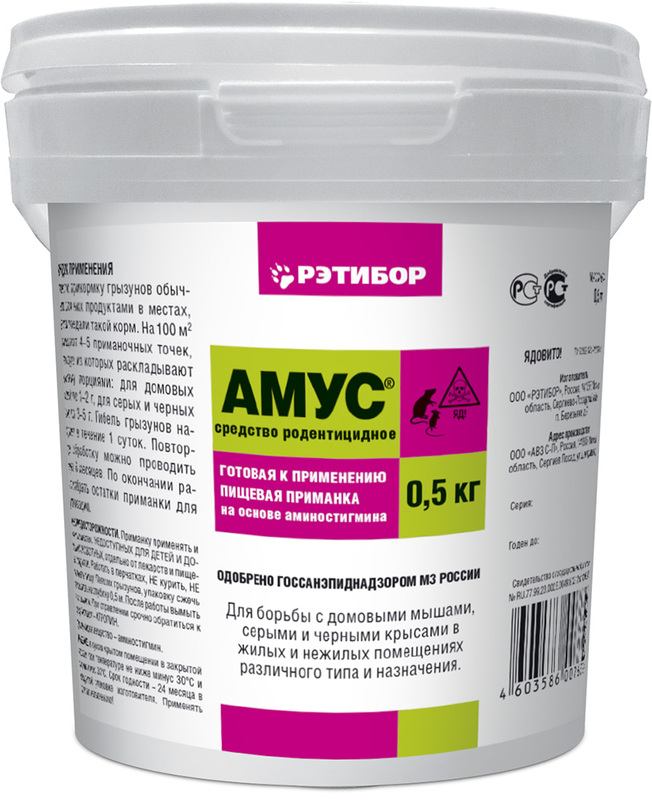 Finished feed bait against house mice, gray and black rats in residential and non-residential premises of various types and purposes, as well as on territory of incomplete constructions. Used by disinfecting agencies and in private life. 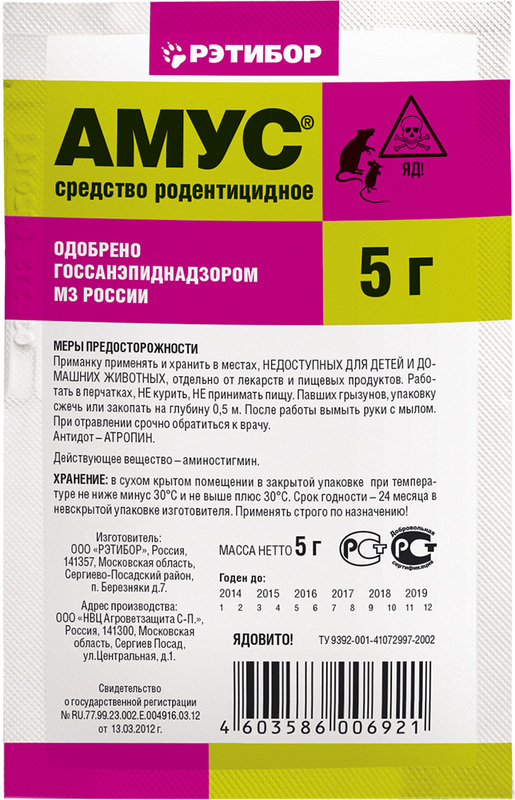 It contains aminostigmin (active anticholinesterase product which is high toxic for rodents) as an active ingredient. Locate the bait (as portions on trays) in previously detected rodent inhabitations (along the walls, non-load-bearing partitions and holes): house mice - 1-2 g, gray and black rats - 3-5 g.
Place in sheltered conditions in order to inhibit access of other animals. So as to increase arrangement efficiency, number lay out points. Depending on dirtiness and rodent occupancy rating, a distance between lay out points is 2-15 m.
Perform baiting with routine meal in places where rodents are used to eat it. Distribute 4-5 baiting points on 100 sq. m. Place portions of the product on any one of them. In case of high rodent occupancy rating, increase number of above mentioned points. Rodents will die within a day. Reprocessing: in 6 months, if appropriate. After termination of arrangements collect bait remains and dead rodents for the further disposal. Only persons above18 years old who have passed special instruction and do not suffer from blood and hepatic diseases, are allowed to perform this operation. While dealing with the product, do not touch it with naked hands. Use gloves instead. All the operations are performed wearing work wear (a coat). Observe personal hygiene rules during work such as: do not smoke or eat; after use carefully wash your hands with warm water and soap. Locate and store out of the reach of children and domestic animals, separately from drugs, food, forage and water. Special precautions are required to use this product in therapeutic and child care institutions, as well as in catering establishments. Prevent contact of children, patients, food and drugs with rodenticides. Arrangements must be carried out on cleaning days. Locate bags in special places available for rodents only. Avoid rodenticide contact with food and drugs, as well as product dissemination by rodents. Process child care institutions and premises available for children in their absence. Then remove all remaining rodenticides before return of children. The same method (i.e. processing in absence of people and food) is appropriate for medical preventive institutions and catering establishments. Store in intact package in special locking cabinet labelled as "TOXIC!" or warehouses intended for storage of pesticides. Register inflow and discharge of the product. Persons living or working in installations to be processed, must be informed about rodenticide presence and observance of safety precautions. Burn or bury non-reusable product remains to a depth of 0.5 m at least previously covering with bleach powder. Store in closed package in dry closed warehouse at -30…+30°С. Domestic use: store separately from food and drugs. Keep out of the reach of children and animals! Shelf life is 24 months from manufacturing date when stored unpacked.